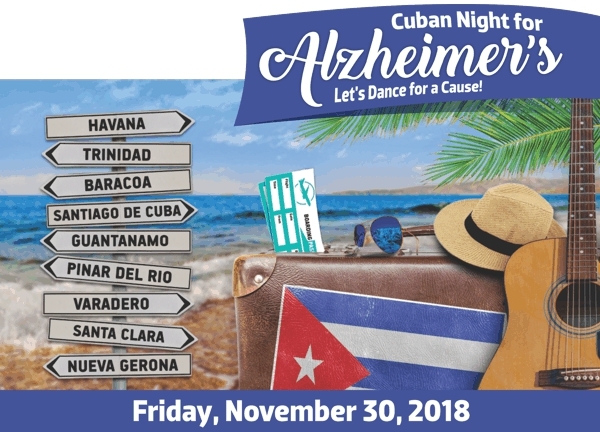 CUBAN NIGHT FOR ALZHEIMER’S, LET’S DANCE FOR A CAUSE! FUNDRAISING EVENT BENEFITS RESIDENTIAL PLAZA’S MEMORY CARE PROGRAM. One-of-a-kind facility assists the Miami-Dade county’s elderly population based on the Association Montessori International, Montessori for Aging and Dementia Program. MIAMI, FL – November 26, 2018- Alzheimer’s is the 6th leading cause of death in the USA. More than 5 million Americans are living with Alzheimer’s today, and by 2050 that number could get as high as 16 million. One way or another, at some point we are or will be affected by this disease. Assistance to the Elderly, Inc. is a non-profit that advocates for older adults in our community, and due to the increasing need for Memory Care, Residential Plaza at Blue Lagoon (owned by the nonprofit Assistance to the Elderly, Inc.) created an affordable 24-hour specialized environment for adults with Alzheimer’s disease and dementia-related disorders, Residential Plaza’s Memory Care Program. The Memory Care Program implements the Association Montessori International, Montessori for Aging and Dementia Program, with outstanding results. The Memory Care Program encompasses 16,000 square feet of full-time living and activity space for the care of 52 full-time residents. The residents enjoy spacious rooms, communal sitting areas, safe access to outdoor spaces with plants, separate dining areas, and a home-like kitchen. All the spaces in the program were designed with considerable attention to detail to improve cognitive abilities – from paint color to lighting specifications. All our staff has received training based on the Association Montessori International, Montessori for Aging and Dementia Program. Assistance to the Elderly, Inc. partners with Residential Plaza at Blue Lagoon and many leaders in our community like FedEx, Lifeline Home Healthcare Providers, Inc., Premier Clinical Research Institute, VITAS, MyCare Pharmacy and Verdeja De Armas Trujillo Certified Public Accountants, and many others to launch an annual fundraising event to benefit Residential Plaza’s Memory Care Program, Cuban Night for Alzheimer’s, Let’s Dance for a Cause! This year the event will be held at the Donna E. Shalala Student Center at the University of Miami on Friday, November 30th. A night full of music by Celia Cruz All-Stars, food, Chinese Auction, Silent Auction, tobacco bar and much more!